Owners of a California golf course are contemplating turning part of it into a wetland bank much to the dismay of some local residents. They claim the banks hold no real economic worth and could diminish property value. However a consultant to the mitigation banking industry says that isn’t true arguing banks can lead to strong earnings and hold recreational value. 30 December 2014 | Owners of the San Luis Rey Downs golf course in Bonsall, California north of San Diego are mining for gold – in this case the highly prized, green gold blooming today in the ecological economy. Golf courses aren’t the draw they once were. They are closing all over the country due to changing pastime preferences. The Vessels family of San Diego County owns a 185-acre property located along the San Luis Rey River that served local golfers for decades before closing last August. Plans are to return the property to its natural condition and to convert a portion of it to a riparian wetlands bank. Once completed the bank’s compensatory mitigation credits will help offset environmental effects of local development or infrastructure maintenance such as for highways and water systems. Turns out that mitigation credits have a growing, dramatic value in relation to other kinds of property uses. 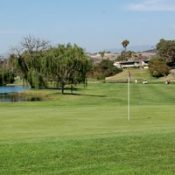 The San Luis Rey Downs golf course will be converted to natural habitat, earning valuable mitigation credits and providing important habitat for wildlife and native plants. Hot headed views like these threaten to condemn the current property owners to doing something different with the parcel than what they believe is in the best long-term interests of their family. And although residents have observed “there are no benefits economically, culturally or recreationally,” it turns out that too just doesn’t hold water. In today’s ecological economy, golf courses such as San Luis Rey may be underutilized in terms of optimum property value. Restoration of natural habitat in exchange for compensatory mitigation credits sold at market rates can lead to strong earnings. The cultural and recreational benefits of natural lands are well known, especially in heavily developed areas like San Diego County. They are the basis of the current state-wide scramble to preserve undeveloped lands for urban regional parks. Apart from the question of whether property owner rights should be protected on principle here, we are left to consider whether a mitigation bank is economically viable; that is, whether mitigation credits really do have reliable marketplace value. A few hours’ study of online public records for wetlands credit values in San Diego County revealed surprising results. As shown for a set of nine data records in the graphic here, prices paid between 2001 and 2013 ranged from $120,000 to a whopping $900,000 per credit-acre. The average price per credit sold since 2010 is almost $380,000, as it turns out. This suggests that if the owners were to convert 38 acres to wetland credits as planned, the property could earn them nearly $15 million, $3 million more than the appraised value of the entire 185 acre tract. Additional revenue would be earned from sale of non-wetland species or habitat credits. Plus there would be very important, long term benefits from protection of biodiversity and other ecosystem service values we are just beginning to learn how to monetize. This underscores an important point often overlooked in today’s emerging ecological economy. Mitigation credits have real value, and that value has been steadily growing for the past decade. Properly done, return of developed properties to natural habitat can pay tremendous dividends. Wetland credit sale prices in the San Diego area have risen dramatically since the early 2000s. The Vessels family has made the best possible decision – one that benefits them financially and also promises long term rewards across the region in the form of natural habitat on which value has always been properly placed. But the real story here is not that a few local residents disapprove of the family’s decision. It’s that the market value of select natural habitat can be so dramatic these days in relation to other, more traditional land uses.